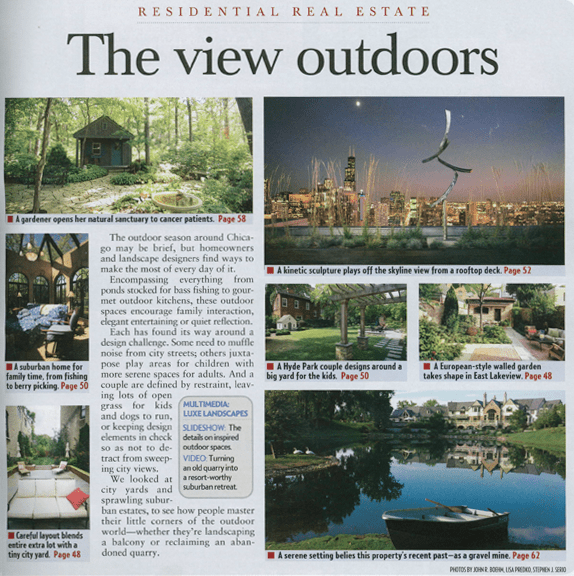 The outdoor season around Chicago may be brief, but homeowners and landscape designers find ways to make the most of every day of it. Encompassing everything from ponds stocked for bass fishing to gourmet outdoor kitchens, these outdoor spaces encourage family interaction, elegant entertaining or quiet reflection. Each has found its way around a design challenge. Some need to muffle noise from city streets; other juxtapose play areas for children with more serene spaces for adults. And a couple are defined by restrain, leaving lots of open grass for kids and dogs to run, or keeping design elements in check so as not to detract from sweeping city views. We looked at city yards and sprawling, suburban estates, to see how people master their little corners of the outdoor world – whether they’re landscaping a balcony or reclaiming and abandoned quarry. Inset: Integrating New Space: Landscaping varied elevations make an L-shaped yard look like it was meant to be. After 20 years in city houses, the Larrea family finally got a yard. But it was tiny and sat just off noisy Addison Street near Wrigley Field, so the only part of the space they used was their back deck. Debra Larrea, 52, a school counselor at Loyola Academy, lives with her husband, Louis, a professor of international marketing at DePaul University, an d their teenage son, Zac, about six blocks from the ballpark. Two years ago, the Larreas bought a two-flat next door, intending to eventually tear it down and expand their yard. They were renting out the building until it was damaged by fire in April. They figured it was time to create the yard they always wanted. “We wanted a basketball court for our son, and we wanted a sizable area of lawn and a patio area for entertaining,” Ms. Larrea says. Their two golden retrievers also needed space to run around. Denise Rosenbloom, owner of Botanical Concepts Chicago, says the family wanted the feeling of a seamless yard in the L-shaped space created when they combined their small backyard with the entire lot next door. After the teardown, the long, empty lot “looked like a big bowling alley,” she says. Now, landscaping wraps around the house to create the illusion that the home is on a large single lot. The yard has varying elevations with a garden, sunken patio, fountain pool and above-grade terrace that serves as a dining area. A brick partition separates a “sport court,” a concrete basketball court that can double as a spare parking space. 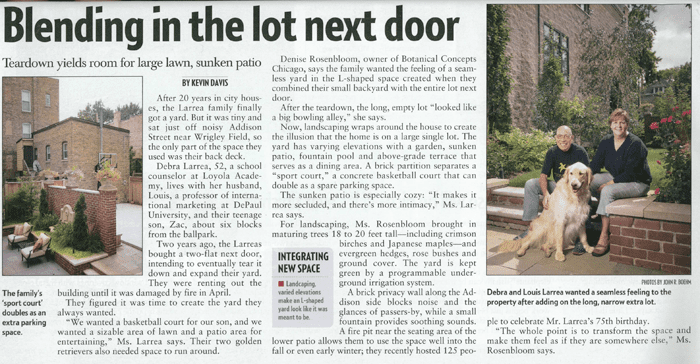 The sunken patio is especially cozy: “It makes it more secluded, and there’s more intimacy,” Ms. Larrea says. For landscaping, Ms. Rosenbloom brought in maturing trees 18 to 20 feet tall – including crimson birches and Japanese maples – and evergreen hedges, rose bushes and ground cover. The yard is kept green by a programmable underground irrigation system. A brick privacy wall along the Addison side blocks noise and the glances of passers-by, while a small fountain provides soothing sounds. A fire pit near the seating area of the lower patio allows them to use the space well into the fall or even early winter; they recently hosted 125 people to celebrate Mr. Larrea’s 75th birthday. “The whole point is to transform the space and make them feel as if they are somewhere else,” Ms Rosenbloom says.